Know what you want before you buy. Unsure what to buy?. Of course you're unsure because you are a new student to Cisco. CCNA Composite Exam: The 200-125 is the composite exam associated with the Cisco CCNA Routing and Switching certification. CABLES 6x KETTLE LEADS 3x CAT5 1x CONSOLE 1x DTE-DCE. 1x WS-C3560-48TS-S 3x WIC-1T. 3x Cisco1841's (Latest iOS 15.0). ADVANCED LAB KIT. 2x WS-C2960-24. Why Buy From Us. We will try to respond to all inquiries within 2 hours. Ubiquiti ER-X EdgeRouter X 5-Port Gigabit PoE Wired Router with Power Supply. Condition is Used. Shipped with USPS Priority Mail. No returns. 1 fixed gigabit WAN port, 1 fixed gigabit LAN/DMZ port, and 3 freely interchangeable gigabit WAN/LAN ports. For defense against external threats, TL-ER5120 features automatic protection to detect and block Denial of Service (DoS) attacks such as TCP/UDP/ICMP Flooding, TCP Scanning, Ping of Death and other related threats. Unit may need to be reset to factory defaults. AC adapter included. Model #TL-WA850RE. The wall-mounted device TL-WA850RE is designed to conveniently extend the coverage and improve the signal strength of an existing wireless network. What's more, its Ethernet port allows the TL-WA850RE to act as a wireless adapter to turn a wired device into a wireless one. NOT suitable for CCENT, CCNA, CCNP, CCIE Routing & Switching Study path. 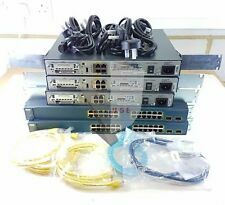 (Cisco 1700 series). Using an AUI transceiver device to connect to the port is a pain and lots of headache! Stay away! Keep Reading and I will give you hints and advise on how to choose your perfect lab and not spending your money wisely. DSL Standards ADSL Lite (G.Lite Itu G.992.2), ADSL Full Rate (G.Dmt Itu G.992.1), G.Handshake (G.Hs Itu G.994.1). WAN Interfaces Analog/Pots, 1x10 BASE-T/100 BASE-Texas, 1X RJ-45 for ADSL. 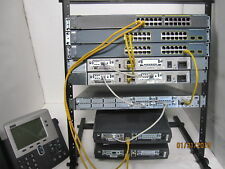 LAN Interfaces 10 BASE-T, 10/100 BASE-T, 100base-Texas. It has five Gigabit Ethernet ports, one USB 2.0 port and a high power 2.4GHz 802.11b/g/n wireless AP with antennas built in. USB Power Reset Yes. 10/100/1000 Ethernet ports 5. MCS7 23 -78. 54MBit/s 25 -80. Firstly; Cisco made CCNA 200-125 V3 exam harder than the CCNA 200-120 V2 exam. Cisco wants to make sure youreally know your stuff on this exam. You need to have a high-level understanding of what is happening for passing the exam. Product code RB760iGS. Compared to the hEX, the hEX S also features an SFP port and PoE output on the last port. The device has a USB 2.0, PoE output for Ethernet port #5 and a 1.25Gbit/s SFP cage. CPU core count 2. Mid Atlantic, LBP-1.5, Lacing Bars with 1.5" Offset. 10 Pcs. The old version of the CCNA 200-120, CCENT ICND1 100-101, ICND2 200-101. CCNA 200-125, CCENT ICND1 100-105, ICND2 200-105. If you want to get Cisco CCNA certification, you need to pass CCNT/ICND1 100-105 and CCNT/ICND 200-105 exams OR CCNA 200-125 exam. Version: V02. Manufacturer: Cisco. No AC adapters are included. 802.11a/g/n Option: Yes (Cisco CleanAir Technology). Integrated USB 2.0/AUX/Console Ports: Yes. Integrated Dial Backup: V.92 Analog Modem ISDN BRI. Bonus DVD With this lab kit we will include DB9(COM) to RJ45 Console cable, if you don't have built in COM interface or COM adapter on your Laptop, PC etc. you will need USB Console cable. 2x Serial Interfaces. USB 2.0 port. Console Cable (RJ45 to DB9 Cable). 12V/1.5A Power Adapter. Internet Connection Type CAT5 Ethernet Cable. 5.51 x 8.0 x 1.38 in. Authentication= Internal User Database, Radius, POP3, LDAP, AD, NT Domain. You can set the two lines up in load balancing mode, where traffic is split across both of them, or into failover mode, where the other DSL line only kicks-in if your primary DSL line fails (or vice versa). With this lab kit we will include DB9(COM) to RJ45 Console cable, if you don't have built in COM interface or COM adapter on your Laptop, PC etc. you will need USB Console cable. - TFTP Software. - SDM Software. The Zhone (Zhone) 6200 ADSL2 endpoints are easily user-installed. All products provide an Ethernet connection that is auto-sensing, eliminating the worry about connection cable type (straight-through vs crossover). Well, I will give you a few reasons:1. As such, once an order has been placed, we are generally unable to cancel the order. Minimum 2" protective cushioning on all sides. FUNCTIONALITY: Power on Tested, no other functions have been tested. 1x ASA-5505-BUN-K9 Firewall. With this lab kit we will include DB9(COM) to RJ45 Console cable, if you don't have built in COM interface or COM adapter on your Laptop, PC etc. you will need USB Console cable. VERY CHEAP PRICE. Runcorn, Cheshire. Geotek.biz Associates LTD. unless NEW IN BOX / SEALED. CISCO AIR-CAP3502E-E-K9 (3502E) Wireless-N Access Point. Add to Favourites. fully tested and cleaned. Well, I will give you a few reasons:1. 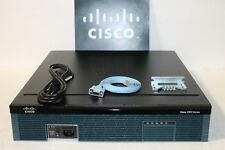 You ended up on this page because you are searching for aCisco CISCO2821 V04. 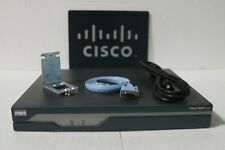 MANUFACTURER PART NUMBER: CISCO2821 V04. MODEL: 2821. Accessories, remotes, software, power cords, cables, etc. are not included unless pictured. Linksys Smart Bridge Wemo 5-1/2"Wx2-3/5"Lx5-4/5"H White F7C074 - Sold as 1 KT. Form FactorExternal - 1U. Network / Transport ProtocolTCP/IP, UDP/IP, ICMP/IP, ARP, BOOTP, DHCP. Data Link ProtocolGigabit Ethernet. Form FactorExternal. Power Provided115 Watt. Compliant StandardsVCCI, EN55022, ICES-003, EN55024, UL 60950-1, EN 60950-1, FCC Part 15.107, FCC Part 15.109. CISCO CCNA CCNP CCIE LAB. 1x Console cable to connect the lab to your computer via COM-Serial port. 1x 2950 Series Catalyst Switch Enhanced Image IOS Version12.1(22)EA14 Layer 2 Switch. (Otherwise will not be accepted.). That's very easy to set the load balancing policy for you. WAN interface online detecting and testing. WAN interface online detecting and testing is to inspect the connectivity of lines through PING/Tracert detecting or DNS request, and it is of great help for administrators to check and rule out the barriers and mistakes. Unless NEW IN BOX / SEALED. Runcorn, Cheshire. Geotek.biz Associates LTD. X1 EHWIC-4G-LTE-V.
Max phoneload sccp version 17. 640-822 ICND1. 100-105 ICND1. Interconnecting Cisco Networking Devices Part 1 (ICND1). CCNA Composite Exam: The 200-120 is the composite exam associated with the Cisco CCNA Routing and Switching certification. • SFP ports for 10G connectivity. • Fully manageable L3 switch, full wire speed switching. 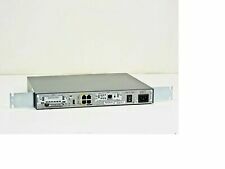 1x CISCO ASA5505-BUN-K9. With this lab kit we will include DB9(COM) to RJ45 Console cable, if you don't have built in COM interface or COM adapter on your Laptop, PC etc. you will need USB Console cable. Product code RB750UPr2. RB750UPr2 QCA9531 (650Mhz) 100M all port test. hEX PoE lite. Less power adapters and cables to worry about! Max current is 1A per port, Ethernet ports are shielded. PoE in Yes. 1x Cisco USB to RJ45 Console Cable. 2x CP-9951-K9 IP Phone without stand. 2x Power Cable. 3x Ethernet Cable.